Let's talk about smoking guns. The phrase originates in a Sherlock Holmes story in which a recently fired firearm, found on a suspect wanted for a shooting crime, is treated as compelling circumstantial evidence. An arsenal of smoking guns litter Theresa May's person, all pointing to her utter incapacity to deliver a negotiated Brexit. They include almost three years of talks that have gone nowhere, ludicrous ultimatums to Europe about caving in to British demands or there'll be no deal, chest-thumping promises that Brexit means Brexit, loss of ministerial colleagues, lack of preparation for the post-Brexit era, and a resounding failure to get her deal through the House of Commons not once but twice. In short, there is a stronger chance of Boris Johnson renouncing the world and joining an enclosed order of monks than an orderly Brexit happening under Mrs May's leadership. The British prime minister's negotiations with the European Commission have foundered on her Tube map of red lines meeting the reddest line of all - the Good Friday Agreement. Like a popped balloon, her vision of Brexit has collapsed on the Irish Border. And she is now a broken leader. The springs are sticking out of her back. A categorical refusal to acknowledge reality has been her undoing - and Europe has lost patience both with her and the parliament she does not govern. Far from taking back control, she has lost what little she had. This week, the European Council of Ministers said put up or shut up. 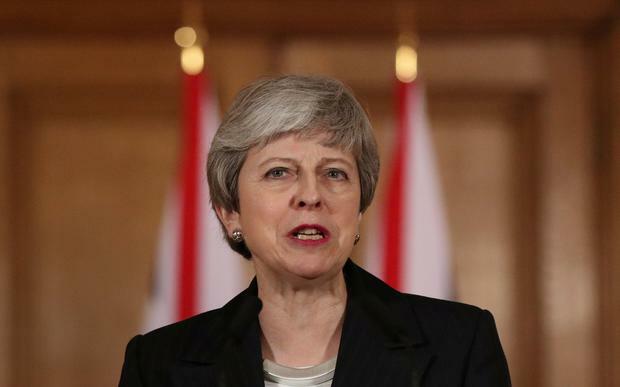 Either the Withdrawal Agreement passes next week, in which case she can have an extension till May 22, the date chosen because it immediately precedes the European elections; or the deal folds (a racing certainty) and the UK's new departure date is deemed to be April 12. Of course, nothing is set in stone and a significantly longer extension is a likely scenario - although not without some new development in Britain, possibly orchestrated by Labour and the Scottish Nationalists, or alternatively a move involving the European Research Group (ERG) and DUP. No doubt, plots are fermenting but who knows whether they will bubble up to anything? Whatever happens, Mrs May is no longer a viable prime minister. It is almost as if Europe has granted her this extra fortnight out of courtesy to give her time to move out of Downing Street. Usually, her own party would have tossed her overboard long ago, but these are not normal times and she continues to stagger on, horribly wounded. Mrs May didn't seek Brexit but inherited it. Regrettably, she isn't capable of steering it through. In that, she's failing in her function. Yet she won't step aside, mistaking dogmatism for determination. Mrs May does not possess the political art of consensus-building and deal-making. Wise counsellors could compensate for that absence, but if there are any in her camp she is not listening to them. Her lack of political adroitness was shown yet again when she used her address to the British people to transfer Brexit wreckage blame onto MPs' shoulders. And she expects them to vote her way now? She has alienated parliament and public alike. If her world view was a rational one, Mrs May would watch her deal fail in Westminster next week and accept she's gone as far as humanly possible. The smoking gun evidence - her finger on the trigger of failure - would tell her she cannot achieve the necessary state of compromise. But Mrs May has two unfortunate characteristics: she is disconnected from reality and is extremely tenacious, meaning she'll limp on to the bitter end. Normally persistence is admirable, but it has long since solidified into inflexibility. Her first but not only mistake was to take the entire weight of the campaign on her own shoulders. She is not Atlas holding up the heavens, she is one woman - who has undertaken more than she is capable of doing. We know why. She preferred to make it a Tory Brexit, in the hope of staving off schism within her party, rather than reach across to opposition MPs. The Conservatives look set to split anyway and she will have sacrificed the common good in vain. Strong leadership is what every nation craves during a crisis. If she truly possessed leadership mettle, she would stake her position on a last throw of the dice: put the deal to parliament, telling MPs to back her or sack her. If they continue to vote down the Withdrawal Agreement, she resigns. However, she appears to have a sense of exceptionalism and destiny, regarding herself as the only person capable of delivering a negotiated Brexit. She even told the British people she was on their side this week, during that atonal address which aimed for harmony but clanged in the ears of Leavers and Remainers alike. Looking back over the exhaustive yet inconclusive negotiations, two hinge moments stand out. One was that July 2018 Chequers plan for the UK and EU's future relationship, when ministers were warned to back her or they would lose their transport and go home by taxi. They supported her in the moment - but drift soon set in and ministers resigned, including Boris Johnson, who warned she was saying one thing to the EU and something else to the British electorate. Then there was the December 2017 deal with special status for Northern Ireland, scuppered at the last minute by a phone call from Arlene Foster, who exposed Mrs May's weakness. Arguably the prime minister's most damaging miscalculation was in not facing down the DUP. She could have pressed on and put special status, an imaginative solution, before parliament. Would it have passed? We'll never know. But the DUP with its 10 votes was allowed to shoot it down without the Commons having a say. Meanwhile, ERG politicians continue to insist a no-deal Brexit wouldn't be so terrible. Do harsh realities impinge on the consciousness of Eton-educated MPs such as Mr Johnson and Jacob Rees-Mogg, where school fees cost in excess of £40,000 annually? Their world is more shock-proofed than most. As for the-people-have-spoken argument, it is not democracy in action to vote for something and wind up with something quite different. Britain is ill-equipped for a no-deal Brexit and many would suffer, as would citizens in Ireland, north and south. The Right Honourable Member for Cloud Cuckoo Land, rampantly over-optimistic about her deal-making abilities, has reached the end of her Brexit road. Mrs May cannot deliver an orderly withdrawal and needs to make way for someone competent to make progress. If she has any friends left in political circles they would be doing her a favour by pouring her a stiff drink and saying: Look, I'm going to give it to you between the eyes - it's time to let go.